1. Thinking the affair is over just because you feel guilty and say it is. The truth is, affairs can be powerful addictions and the entanglement often has a tighter hold over people than they often realize. This is one of the most common mistakes of unfaithful wives, which is why it’s #1. Many people who’ve been involved in an affair, actually need more outside help and support than they first realized (that includes me in that category). Read this post on 5 reasons why ending an affair is so hard. 2. Making an agreement or alliance with your affair partner about how the affair should end. Ending the affair should be your decision, because you know it’s the right thing to do. If you consult with your AP, you’ve just added additional secret alliances with him, which only leaves the door open later to resume contact, to see how the other is doing. Be sure to get my FREE exclusive magazine “breaking free”. 14 pages on ending an affair, with a No Contact checklist, and sample break up letter inside! Sign up in the pop up. 3. Believing you can remain friends with your affair partner, once you break it off. This never works out, although it’s a common thing many affair partners think they can do. Yes, it can be especially hard to severe all ties if your families are connected somehow or if you see this person at work etc..
but trying to remain friends is keeping the option open to start the affair up again, just like in #2. The temptation to do this will be greater than if you severe all contact from the beginning. with both your AP and your marriage. But it’s often not true. Secret affairs get exposed one way or another and the damage is widespread to all involved. so you’ll be hurting yourself too even if nobody finds out. Confused on how to end the affair when you’re ambivalent? Read this post. 5. Going back and forth into and out of the affair. than people realize and many cave into the Affair Withdrawal stage that comes after a break up. If one acts upon that loss by contacting the AP again, the recovery and healing is greatly delayed. 6. Breaking it off with the affair partner in person. Somehow we often feel that the affair should be broken off in person, like we’re lessening the blow to the affair partner. to end the affair at all. Knowing how to end an affair for good is important, and it starts with how your break it off. Don’t do any in person break ups, unless you have someone else go with you, but even in that case I don’t suggest it. email or phone call (I’d suggest with your spouse listening, if they know about the affair). 7. Defending the affair partner, and feeling badly for them when you break it off. Your allegiance is to your husband, he didn’t have a say about this affair. But it’s highly likely your affair partner knew you were married, so they knew what they were getting into. Perhaps he doesn’t have a good marriage or life, and you feel badly for him. But that’s not your issue, and you’re not his rescuer. He needs to talk responsibility for his life and marriage (if he is) just like you need to for your life and marriage. It’s often very hard for a betrayed husband to hear his unfaithful wife defend her ‘poor AP’. that pedestal. Reading this post about would your affair partner make a good husband may be helpful to lift the fantasy in your mind. 8. Dribbling details over time, or excluding facts all together. It’s very hard to face the consequences of our betrayal, and we often feel worse telling all the facts to our spouse. So many wives will dribble details, or trickle truth, a little at a time. But that’s one of the worst things you can do because your husband never has a baseline to begin healing from. There’s not an opportunity to regain trust in you if new information keeps coming out. Couples need a ‘ground zero’ of all the truth. Preferably early on, like discovery day. I know it’s hard to do, but the damage will be worse if he finds out more lies later. It’s like picking a scab over and over again that’s trying to heal. Just rip the band-aid off without trying to manage your husbands reactions. is your opportunity to start fresh with truth and integrity. Your betrayed husband needs to know the details to heal. Now some details he’s asking for might actually be worse to get those images out of his head, so I always advise betrayed husbands to be careful what they really want to know. 9. Blaming your spouse or defending your actions. There likely was some issues in your marriage, or within yourself, that made you feel lonely or whatever your reasons were. But blaming your husband for his lack of attention, or defending yourself for having the affair, only shows him you’re not really sorry for what you did. Much like Adam and Eve did in the garden, we all continue to blame others for our actions, it’s human nature. Yet, until you own up to the choices you made to have an affair and recognize there were other, better ways, to have dealt with the issues, you both can’t heal. length of time it’s taking him to heal. and want to move on to being normal again. But the truth is, it won’t ever be ‘normal’ as it was before, (that’s not to say it’ll stay this bad, it doesn’t have to at all). But just as it takes time for someone to grieve the loss of a loved one, your husband needs time to process, and grieve, the loss he feels as a result of your infidelity. being less of a man now. They need time, and often outside help and support, to get through this. If that healing is rushed, it likely won’t ‘stick’ or be complete. 11. Not acknowledging, or minimizing, the trauma they’re feeling. which feels a lot like a trauma. They’re going to have triggers and visions or images in their head. Minimizing these traumatic triggers only makes them feel worse and you’re not helping them heal that way. One thing that helped my husband is when I’d sit and listen to him, or hold him if he wanted me to. more uncompassionate about the pain your infidelity caused. Yes, it’s hard to witness his grief or anger, but sit with the pain, and allow him to grieve. 12. Continuing to tell lies, half-truths or lies of omission. This is similar to #8, trickling truth over time. But this about the outright lies we tell, to keep our secrets hidden from our husbands. It usually stems out of fear of what will happen if he really knew the whole thing. I’m not saying every little detail needs to be shared, unless he’s asking for it, and even that needs to be handled delicately, as I said in #8. But he can’t begin to trust you again when more lies keep coming out. about what lie to keep covering up or what was said or not said. 13. Not recognizing the amount of his healing that’s dependent upon you. As wayward wives, we have more ability to help our husbands heal from our affairs than we realize. 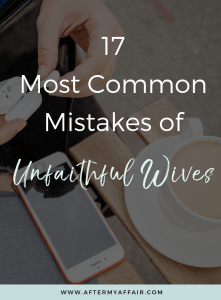 They still have to do their part for their healing and not make the mistakes that many betrayed husbands make, which you can read about here. But by not making the mistakes on this list, and working at doing all you can do to restore his trust, you’re helping him heal much faster than if you pulled back. If you want your marriage to survive your affair, then being willing to do whatever it takes to heal his heart should be your first priority right now. You can be a great source for your husbands healing, if you want to be. Humility is important for this to work. 14. Telling your husband he’s got to forgive you and to trust you again. We can ask our spouse to forgive us, but we can’t make them forgive us. To do so only minimizes their pain again. He needs to work on his forgiving you alone, there’s not much you can do to make him forgive you, that will come with time if he’s willing. It’s the same as telling him to trust you again. Trust needs to be earned and it takes a lot of time and consistent effort to be restored. Telling him to trust you won’t make him trust you and only undercuts his healing. phone number or block the AP calls. Little steps of rebuilding trust add up over time, so don’t get discouraged if it seems to be taking a long time. 15. Being passive aggressive, withdrawing from him, or giving him the silent treatment. Your husband might do some things, in the wake of your affair, that really hurt. You might feel you had a right to an affair because of years of neglect on his part (although you didn’t). But we wayward wives often feel like we lost our right to express our frustration or anger toward our husbands because we were the ones that strayed. So, we withdraw and don’t talk to them. But it’s really another way to be passive aggressive and only hurts the recovery process for both of you. If there are issues you need to raise about the marriage, seek out a good marriage counselor to help mediate those issues instead. 16. Living in guilt, shame and depression over your adultery. Look I get it, this one hits home for me. and you’re suddenly more aware of the damage your actions have inflicted. Guilt has its role in waking us up to the wrong choices we’re making, ‘we did something bad’. It’s a tool to get us to see what we’ve done wrong, shame can be a tool too. But shame tells you ‘you are bad, look at how terrible you are.’ Depression often follows right behind shame. As long as you’re looking at yourself with shame, you’ll stay in depression. This only keeps your eyes on yourself, and off the process for healing. It’s a fine line between addressing what we’ve done to heal from it, and allowing shame to cripple us from moving forward. Even now, after 12 years, shame wants to knock on my door, ready to deliver up depression and self-pity. But I go back to knowing God has forgiven me and there’s nothing I can do to change the past. All I have is now, and my future, to make it better. Read ‘Overcoming the shame of infidelity’ where I list 6 ways to get free. 17. Being inconsistent in your recovery, and in your behavior. The only thing your husband has to trust you again is your actions now. If he sees you inconsistent in your recovery plan, or in and out of doing the work, trust won’t grow. Think of it as a delicate rose that needs to grow from a little seedling into a beautiful rose again. When you work your program and are willing to do whatever it takes to help him heal, that rose will grow. When you don’t seek support for your own recovery, and make excuses for your unwillingness to do whatever it takes, it sends a message to him that you’re not serious. Don’t stomp on little bud that wants to bloom one day. Show him, and yourself, that you are serious about getting the support, counseling and whatever you need to do for your recovery, and his. If you you’ve made any of these mistakes, take heart. Most of unfaithful wives have made some, if not all, of these mistakes. Your emotions are likely all mixed up, and it’s hard to separate the truth from the lies that we’re believing in our heads. But also, take inventory of your life. Grab my e-book where I spell out exactly what we did right, to save our marriage.